These Greek chicken wraps are perfect for meal prep! Prepped and cooked in under 30 minutes, and makes four delicious, healthy lunch options. It’s about darn time these Greek chicken wraps got their very own post! You might remember this chicken wrap recipe from our September 2017 Lunch Prep Challenge. We made it at the same time as we made Chickpea Buddha Bowls…and it’s taken me a whole year to get them up on the blog. 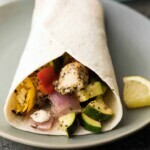 Not only are these Greek chicken wraps SO easy to prep (I heart sheet pan recipes! ), but it tastes delicious and is full of wholesome ingredients. they make four delicious lunches, and they still taste SO good on day 4! 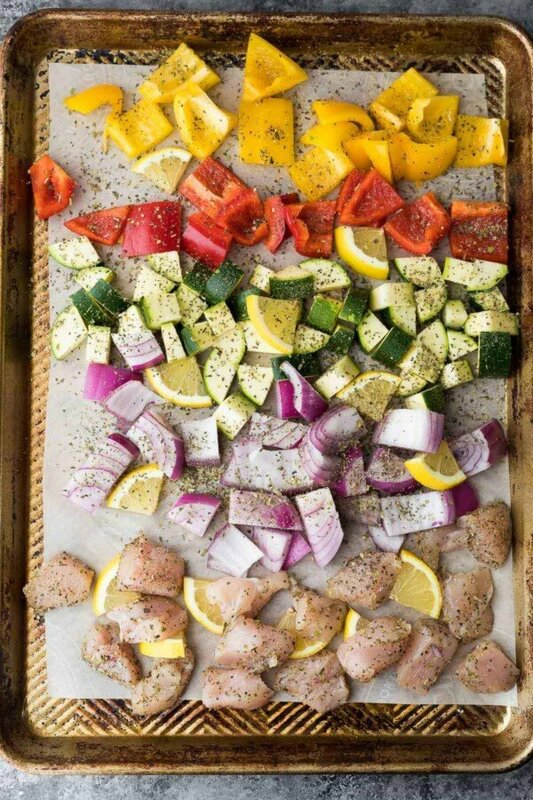 This is one of my favorite ways to meal prep: bust out that sheet pan! Toss chicken, zucchini, bell peppers and onions with a Greek-inspired spice rub and some olive oil. Arrange on 2 sheet pans with lemon slices. 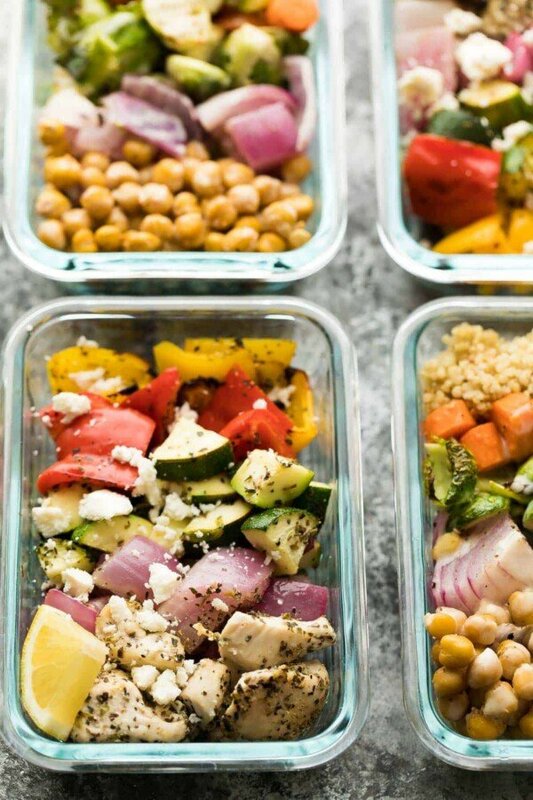 Divide into meal prep containers. Cool, then sprinkle with feta cheese. Reheat before spooning into wraps. Enjoy! Seriously…could these chicken wraps be any easier?! 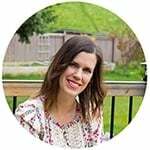 Can I make this Greek chicken wrap recipe vegan? Sure! I’d swap the chicken for a 19 oz can of chickpeas (roast them right up with the veggies!) You’ll also need to omit the feta and may want to increase the seasoning to account for the loss of saltiness. Is this chicken wrap recipe healthy? 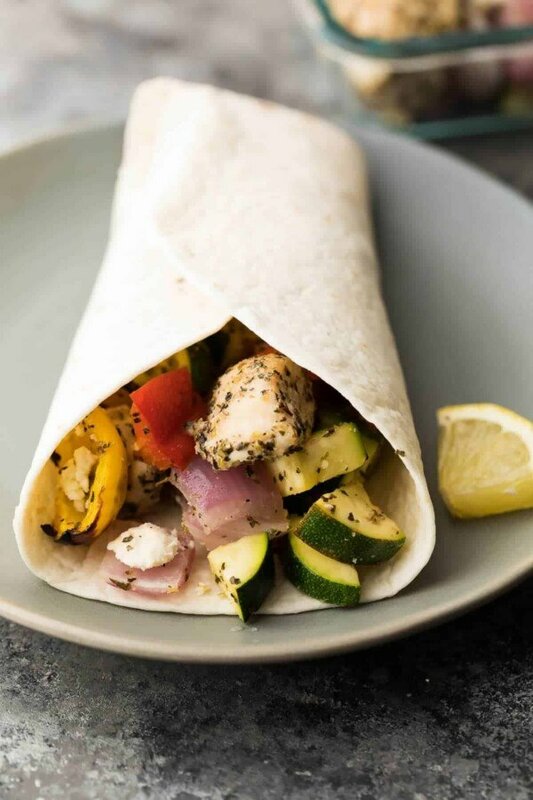 Unlike some of the chicken wrap recipes on the internet which contain caesar dressing, bacon and lettuce, this Greek chicken wrap recipe is full of wholesome ingredients. Tons of vegetables, lean chicken breast. I definitely consider these to be part of a healthy diet! Can I freeze the filling for these chicken wraps? I find freeze/thawed roasted vegetable to be quite soft and slimy (especially zucchini!) so I don’t recommend it for this recipe. Toss the chicken, zucchinis, bell peppers, onion, olive oil, oregano, basil, garlic powder, onion powder and salt. Spread out 1-2 baking sheets and arrange the lemon slices underneath. Bake in the oven for 15 minutes, until veggies are soft and chicken is cooked through. 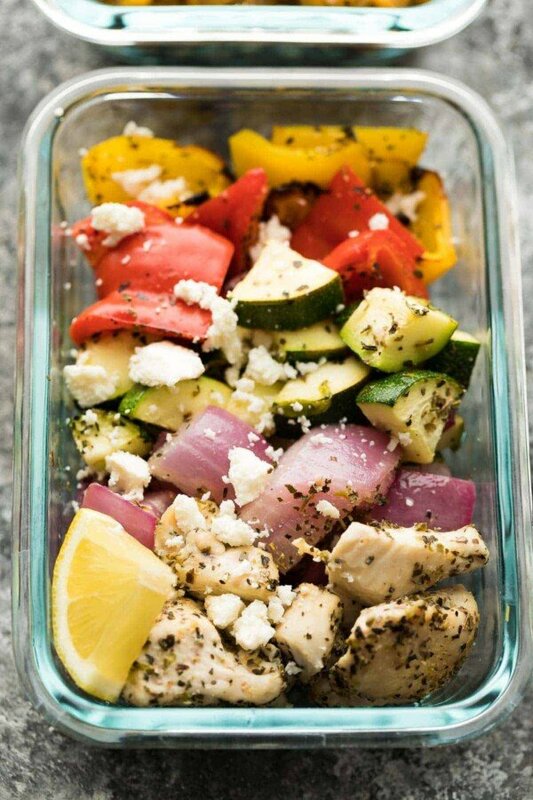 Divide the chicken/bell pepper/zucchini/onions into two 2 cup storage containers (remove the lemon slices). Sprinkle with feta cheese. Heat in the microwave, then spoon into a tortilla or wrap. Very easy to make and very tasty. Glad you enjoyed! Thanks for taking the time to leave a review, Chris!